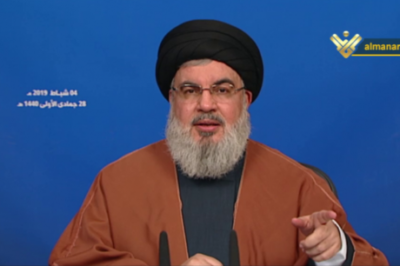 In a televised speech today Hezbollah chief Hassan Nasrallah denied that his party controls the new Lebanese government. “The government is the government of all those taking part in it.” He said. “Saying that the government is Hezbollah’s government is a wrong description. Ethically, this is a lie and the right description is that this government is comprised of a group of political forces in Lebanon among them Hezbollah”. He was responding to comments made by Israeli Prime Minister Benjamin Netanyahu who claimed that Iran-backed Hezbollah now controls Lebanon government and vowed to stop all acts of aggression from Lebanon , Syria or Iran. Commenting on US warning that Hezbollah could divert funding from the health ministry which it now controls he said. “We don’t want projects, business or anything and we don’t want to be accused of anything, seeing us our primal concern is humanitarian. Nasrallah added : The money of the Lebanese state belongs to the state and there is a legal responsibility towards this money in addition to the ethical responsibility, because the minister and the ministry are entrusted with this money. Nasrallah went on to say : “The health minister is for all Lebanese and all regions and so is the health ministry.” . Nasrallah called for combating corruption and the waste of public money and offered to be a partner in addressing the difficult files. He concluded his speech by calling for “calm and rapprochement”. As in the case of the formation of all previous governments Hezbollah was accused of being behind the delay in formation of this government when it pressed a demand for one of its Sunni allies to be given a post in a new government after politicians agreed on a government makeup . You prevent the formation of the formation of the government and now you warn about economic threat after the economy of the country collapsed. Offering to be a partner is a joke . To be a Hezbollah partner means do as I say or the men in black shirts will be on their way to take you away .